One of the two expansive solar arrays on NASA's InSight Mars lander dominates this view of the probe's Martian home, the plain of Elysium Planum, as seen on Dec. 4, 2018. NASA's Mars InSight lander, which touched down on the Red Planet Nov. 26, is starting to settle into its new home and prepare for its scientific work — and the robot has shared three new photographs of its progress with its minders here on Earth. The lander transmitted all three images taken by its Instrument Deployment Camera to Earth on Dec. 4. The images will help the team behind the lander make sure everything survived its dramatic journey to the Martian surface safely and will guide their decisions about precisely where to deploy individual instruments, a critical process during the spacecraft's first weeks at its destination. As planned, InSight's workspace is lacking in dramatic landmarks, mainly sporting a flat vista and some rocks. The mission team purposely chose a seemingly boring site for the landing in order to ensure the highest probability of a successful touchdown. NASA's Mars InSight lander photographed its robotic arm and the Martian soil near its landing site on Dec. 4, 2018. The InSight team had been expecting more photographs this weekend from its newly arrived lander. 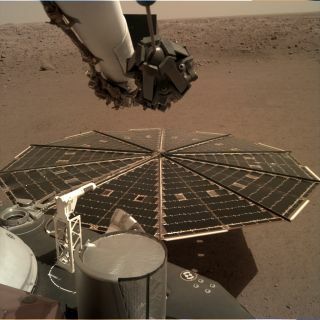 However, the lander is programmed to be particularly sensitive to anomalies until it settles in to its new home, and a slip into fault mode briefly prevented the photostream from leaving Mars. The team is not particularly concerned about the incident, according to the statement. "We did extensive testing on Earth. But we know that everything is a little different for the lander on Mars, so faults are not unusual," Tom Hoffman, InSight project manager, said in the statement. "They can delay operations, but we're not in a rush. We want to be sure that each operation that we perform on Mars is safe, so we set our safety monitors to be fairly sensitive initially." NASA's Mars InSight lander's instrument deck stands out against the reddish Martian soil in this photograph, sent to Earth on Dec. 4, 2018. Once engineers have finished checking up on all the instruments, they'll need to decide where to place the instruments, which may not occur for another two or three months. It will do so using the folded-up claw visible in two of the new images. Those instruments will help InSight solve mysteries about the interior of Mars, including its structure and how heat flows through it. Scientists hope that with this new data, they will better understand how Mars — and the rest of the planets, including Earth — formed. NASA's Mars InSight lander captured this spectacular image on Dec. 4, 2018. It shows the lander's seismometer in the foreground, the cover for that instrument behind it, its self-drilling heat probe to the left and its robotic arm at the top.